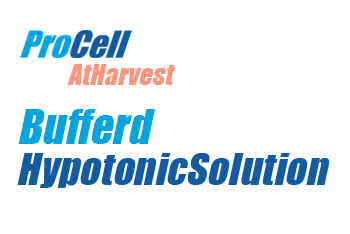 Buffered Hypotonic Solution is a hypotonic solution developed for bone marrow specimens. It has been found to achieve good metaphase swelling (spreading) from a wide range of sample types and significantly increases the number of useful metaphases in leukaemic bone marrow cultures when compared to the standard 0.075M KCL hypotonic. It contains 0.4% KCL with HEPES. 1. Add the powdered contents of the supplied bottle of Buffered Hypotonic Solution product to 1000 mls of distilled water. 2. Adjust to pH 7.4 with 5N NaOH and store at 4°C in a clean glass bottle, until ready to use, noting down the date on the bottle. 4. 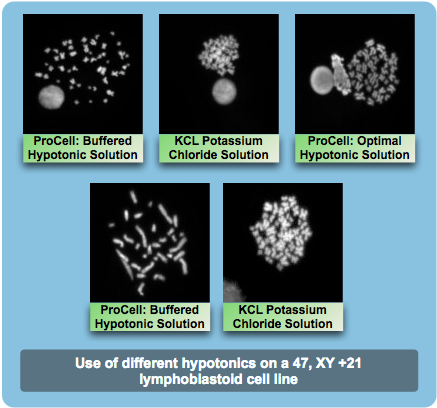 Replace your existing hypotonic and incubate cells at 37°C for a maximum of 30 minutes.